For a brief moment in High School when I had an inspiring English teacher I thought I would become a writer. It was a very brief moment. But what goes around comes around. So today I’d like offer some assistance to the writers of Mad Men, the TV series that has now been nominated for 17 Emmy Awards. Obviously these guys need my help, and they have ever since the first season. The last episode of Season 1 contains two scenes that have become iconic. The first is Don Draper’s marketing pitch to Kodak in which he coins the term Carousel for the gizmo that holds the slides on the top of their newly introduced home projector. Rather than talk about the product itself he conjures up what has become the Kodak Moment, as he uses pictures of his own family to illustrate the campaign. It’s a brilliant re-creation of what may have happened in real life. If you haven’t seen it, click here, and spend a few minutes being amazed. The characterization of the two geeks who want to talk about their wheel and the hardware is so spot on, it’s perhaps just as good as the Draper portrayal. As with all great marketing men, Draper is the first to fall for his own spiel. On the way home after that performance he visualizes being warmed into the bosom of his own family. Since he had previously announced to his wife and kids that he would not be spending Thanksgiving with Betty’s family it’s heartwarming to see him change his mind and be reunited. Unsurprisingly, when he arrives home the house is empty and we realize the warm family scene we just witnessed happened only in his imagination. 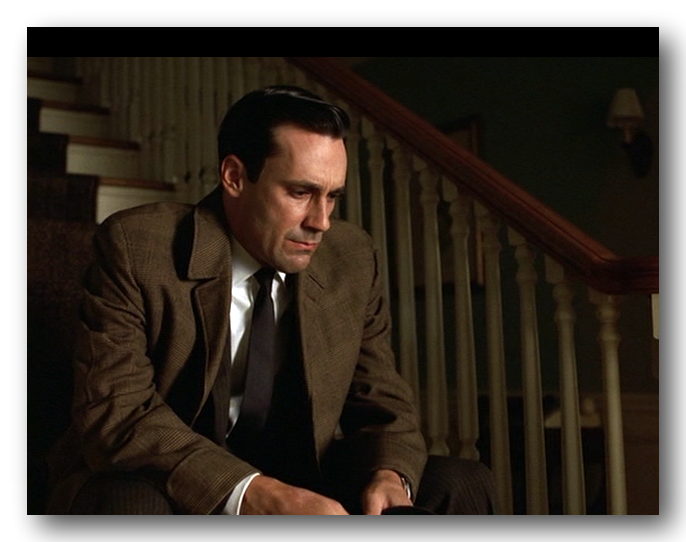 At this point the second iconic scene take place as Draper sits alone in the house as the Episode and the Season fades out to the music of Bob Dylan’s haunting “Don’t Think Twice It’s All Right”. Click here for this segment. The Kodak scene has become famous enough to inspire a number of parodies. The Dylan ending garnered enough attention to now be included in the history of the song itself. But is that good enough? Here’s how the final scene would have played out with my involvement. Not a big change, but I think you’ll agree we’ve stepped it up a notch. And here it is … we replace Dylan and Don’t Think Twice with Joni Mitchell and The Circle Game, whose lyrics are even more appropriate given the situation. I know, I know. I should have listened to my High School English teacher. Final Note: Although I’m officially retired now, the Mad Men writers should know that I will consider all serious offers. « What Does A Verizon Moment Feel Like? So, are you really going back to work? It’s not too late. But then I’d probably need to find a job too. Great post! I’m working on my acceptance speech, just in case. But I don’t think we should quit our day jobs quite yet.